Concrete, aggregate and cement interests are well represented in parties challenging the rationale, compliance costs and burdens—along with a timeline from announcement (August 28) to close of a four-month public comment period (February 11)—tied to the Occupational Safety & Health Administration’s Notice of Proposed Rulemaking for Occupational Exposure to Respirable Crystalline Silica. Over a public comment period twice extended from an initial 45-day target, OSHA received 3,000-plus responses to its proposed reduction of permissible exposure limits (PEL) for quartz from current General Industry and Construction thresholds—100 and 250 micrograms per cubic meter of air (µg/m3) expressed in eight-hour weighted averages, respectively—to a uniform 50 µg/m3. On behalf of NRMCA member producer, Mississippi-based MMC Materials, David Bosarge, vice president–Safety & Environmental, cites his company’s annual quantitative industrial hygiene evaluation of yardmen, drivers and plant operators. “Over the past 10 years, employees who were monitored for their exposure to respirable silica (as quartz) and respirable particulate had time weighted average exposures that were determined to be below the laboratory’s level of quantification, and thus the corresponding OSHA PEL,” he affirms. The proposed rule would present precast producers significant challenges in terms of reducing the potential exposure to an almost nonexistent level, increasing the specifications on when respirators are required, and accurately measuring a new respirable silica concentration threshold with any level of certainty based on technology currently available in the field and at laboratories throughout U.S., contends National Precast Concrete Association in its comments to OSHA. With much overlap among its member producers’ operations and downstream customer activities and those of NCMA’s, the Interlocking Concrete Pavement Institute weighs in with OSHA as well: “ICPI's view is that the entire proposed regulation presents severe flaws regarding inaccurate cost projections and incomplete consideration of all the cost impacts that occur in real-world manufacturing and construction application. ICPI suggests a complete revision of the proposed regulation on this point alone,” comments Executive Director Charles McGrath. Among OSHA projections ICPI questions are total ancillary costs, $22 million, for concrete product operations of all sizes complying with the revised PEL. 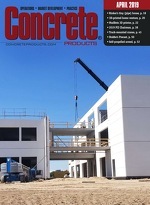 Concrete producer trade groups and the American Chemistry Council Silica Panel, McGrath notes, peg the total ancillary costs for manufactured-concrete producers at $338 million. OSHA additionally underestimates cost impacts on construction industry segments downstream of concrete paving stone and segmental retaining wall unit production. An ICPI consultant finds higher multiples of actual cost impacts, versus agency estimates, on the key construction sectors of residential building (8X OSHA cost impact estimates); nonresidential building (5X); highway, street and bridge construction (4X); and, foundation, structure and building exterior contractors (4X). The next step in the Occupational Exposure to Respirable Crystalline Silica rulemaking is a series of public hearings OSHA will begin in March—concrete industry representatives among a host of scheduled presenters.